Steel car ports are made of metal structure that gives your vehicle protection from rain, heat, snow, winds, other inclement weather and even bird droppings. Read to know more. It snows heavily outside, you have all your protection gear ready, the fire is in place, the warm clothes are on and you sip on your hot drink. Wait, do you remember that your vehicle is parked outside without a car port, drenched in snow with a damaged and haggard look? Well even if you do, what arrangements have you made? Have you heard about our steel steel carports for sale ? While not a situation that a car lover would ever want to let his car nor even himself face in inclement weathers, such events do happen and most assured is its solution: Ensure our car ports metal stands the test of time. A lot of people face this dilemma of how to provide shelter to their vehicles but limit their options with stick built. How about going a little mobile as well as creative with carport covers from CPM. With Steel car port designs you can let your creativity do some of the talking and settle for a design and color scheme that solves your shelter woes and brings in a lot of aesthetics as well. Steel carports take sturdiness to a new level. Not for just cars our steel portable carports can be used for storing various vehicles like bikes, cycles, trucks, boats, SUV’s and RV’s. These are stronger, cheaper and far easier to build than the garages made of wood. Steel building plans depending on the size, can be erected in an hour or so without much struggle, cost and clutter. Steel carports structures can be used for residential complexes, corporate houses parking, public parking, schools and colleges to any complexes that require shelter for their vehicles. 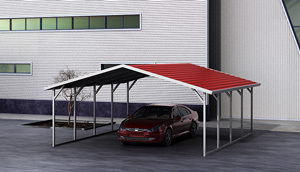 A Steel carports can be constructed and connected on plain ground, concrete, wooden decks and asphalt. There are various kinds of bolts, wedges and anchors to secure the DIY steel carport design to the various surface areas. These anchors are then fixed into the ground to provide stability to the structure. Galvanized Steel covers are metal structures erected on free footing style. It has a roof with open sides. The roof is either rounded, pitched to a point downwards and can have boxed eaves. These roofs are made of steel frame tubing and sheet metal panels that provides it with good strength. The strength and durability of the steel cover depends on its gauges and they range in size from 8 to 60 ft in width and 12 to 100+ ft in length. Steel car ports and materials can be bought from our website. Scroll through our website for your best bargain prices and strong designs.